I am always blogging about how great wall decals are, and this weekend I finally put one up myself. Although a bit more challenging than I thought, it is definitely worth it! I ordered my decal from Leen The Graphics Queen on etsy. 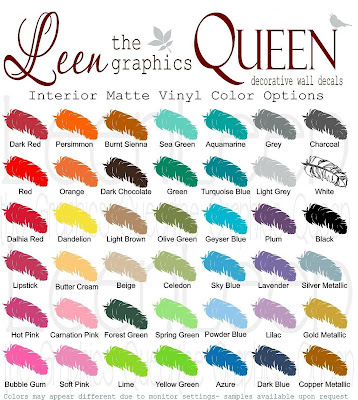 She has a great shop with a huge selection and tons of color choices. I ordered a sample of the dark red from her before I bought the entire thing and it was perfect. Her colors are not super shiny so they don't look cheapy at all. Easy steps to apply your decal: Note, I think you need 2 maybe even 3 people to do this successfully. I would not try to do this alone! 1. First, rub over your decal with a credit card or similar item to ensure it is sticking firmly to the transfer paper. 2. 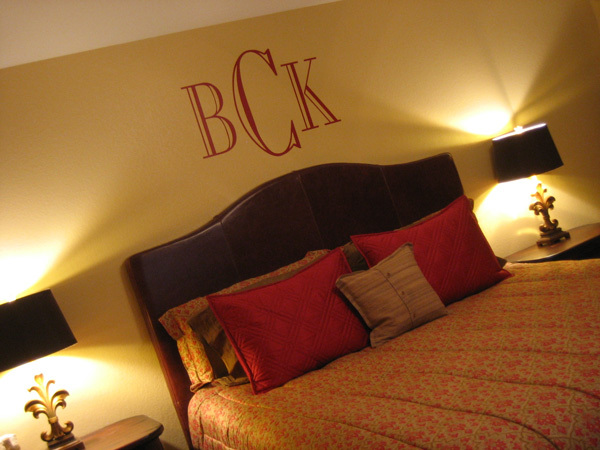 Then, choose your desired wall location and place your decal on your wall exactly the way it comes. Use small pieces of masking tape to hold it into place. 3. Then measure your decal to either the ceiling or floor, whichever is easier to ensure your decal is straight. Make sure you measure from the decal itself, not the white paper your decal comes on as this may not be straight. Adjust straightness of decal as needed by pulling up masking tape, adjusting and re-taping in place. 5. Flip up the decal and peel the backing paper off. Pull slowly and make sure no parts are sticking to the paper you are pulling off. The masking tape is now working as a hinge. 6. Then slowly bring the decal down, using something like a credit card or ruler, rub over the decal pulling down into place with no wrinkles. Work from the top center down and out. Once the decal is down it can not be lifted back up without ruining it. This is where 2 people come in handy. Also, a credit card was not hard enough for me, I found that the end of a wooden spoon or spatula worked better and allowed me to push harder. 7. Carefully peel off the transfer sticking paper to reveal your decal. Pull at an angle and watch that your decal is sticking to your wall. If you notice that any parts are pulling up with the transfer paper, re-rub onto the wall, or help pull it off with your fingers and smooth it onto the wall. 8. Once you have peeled off all the transfer sticking paper gently rub the decal one more time to ensure that it is properly adhered. I have very textured walls so I was worried about little gaps showing but you can't see any at all. I am so pleased with the results!